The 2015 FIFA Corruption Case Extends to North and South America? Yes, in fact it did. When the United States Department of Justice turned on the lights in 2015 for the international rooms of soccer and corporate executives, these execs were caught with their hands in multiple cookie jars. The price for the extra sweets, an indictment for racketeering, conspiracy and corruption. So what happened? Upon the initial filings, 14 people (9 of which were FIFA officials) were indicted by the U.S. FBI and IRS with investigation into wire fraud, racketeering and money laundering. There was an indictment? Yes, in case you don’t read the paper, watch the news, listen to the radio, participate in social media or happen to live under a rock, there was a 160 page indictment listing 25 co-conspirators in addition to the 14 named defendants. The indictment reads like an adventure novel, one filled with crime and a global footprint which spanned decades large payments as commercial value increased in South America and in the U.S. Now Enter CONMEBOL and CONCACAF stage left. I become lost in the tales of bribes, conspiracy and back-scratching that spanned for decades. The irony, that a sport providing hope and meaning to the poorest in the world as an expression of pure nationalism was underpinned by a dark political and economic machine of greed. How involved were these regional bodies? Just to give you a hint at the scope of their involvements, the last three presidents of the regional bodies CONCACAF and CONMEBOL all have been indicted. Clearly this summer 2016 COPA América Centenario tournament is implicated by the involvement of its regional bodies that enable the tournament, but additionally it was the commercialization of this very tournament’s commercialization, sponsorship and television rights that were polluted with these happenings. Indeed, the perfect storm was formed from the combined tournament of CONCACAF Gold Cup and CONMEBOL’s Copa América. Its shadowed darker backstories are colored with dirty bribery, fraud and money laundering as it pertains to media and marketing rights. I’m not going to provide a reenactment of what happened in the FIFA corruption scandal, but rather just the primary players in the scandal as it pertains to Copa América Centenario. Additionally, it is important to review the continued workings and impending occurrence of the tournament in June 2016, which can be framed by asking the questions, why is the United States hosting the event and who are the organizations and companies “picking up the pieces” of the dirtied commercial, television and sponsorship rights. The note below from the U.S. Soccer News Release is an excellent preamble to the following narrative, as it reminds one that the integrity of the event is being repaired and expected to be a success in a professional and principled manner. In this convoluted game played by soccer executives and sports marketing and commercial agencies from around the world, the roster is long and the teams are not mutually exclusive. Aligned with the theme of macro brush strokes on the topic, a look at the larger soccer agencies and the tournament itself will shed light on the inner workings of this world of football finances. The Copa América Centenario is a combination of tournaments, which allows for immense star power and scale to compete with The European Championship, which will occur concurrently in June 2016. The two América bodies of interest are working in conjunction during the summer of 2016 to create the Copa América Centenario by combining their hallmark tournaments. First up we have, CONCACAF. It comprised as many as 41 member associations, representing organized soccer in North America, Central America, the Caribbean and three South American countries[7, pg. 9]. CONCACAF is headquartered in Miami, Florida. [7, pg. 9] Their flagship tournament is the Gold Cup where 12 teams compete for the regional championship every two years. Additionally there is CONMEBOL, a soccer confederation headquartered in Paraguay, comprising of 10 members associations representing organized soccer in South America, with Copa América occurring every two years as their main tournament to determine the regional champion of South America. Below is an image of their six regional FIFA associations, whereby CONCACAF and CONMEBOL are the two of interest for Copa América Centenario. The FIFA Regional Associations Including: The AFC in Asia, CAF in Africa, the Football Confederation (CONCACAF) in North and Central America and the Caribbean, CONMEBOL in South America, UEFA in Europe and the OFC in Oceania. The issue for Copa América Centenario is the bribery charges for the sale of commercial rights to tournaments in North and Central America. Perfect, let’s try to all on the same playing field of understanding. The commercial rights for the tournament include: sponsorship (rights and services), broadcast rights, broadcast services, and limited digital rights. The revenue generated by the commercialization of media and marketing rights associated with the Copa América has increased dramatically throughout iterations of the tournament. Increased revenue and profits have been and continue to be contingent upon successful promotion in the U.S., including contractual relationships with an array of broadcasters and advertisers based in the U.S. 1. Just what were these exclusive rights? These rights included the guarantee of being the lone seller to broadcasters, sports companies and various commercial sponsors on a global scale. Now for that little background, let’s dive into the details of Copa América Centenario’s Shadow Game. In brief, the integrity of the tournament was in jeopardy when 14 soccer administrators and marketing executives were arrested in May 2015 on corruption charges. Listed under the DOJ Indictment Section of “CONMEBOL/CONCACAF Copa América Centenario Scheme,” the document goes on to describe the happenings from 1991 – 2011 whereby Traffic entered into contracts with CONMEBOL, obtained and retained through bribery, awarding Traffic the exclusive media and marketing rights to all editions of the Copa América from 1993 to 2011. [7, pg. 102] The indictment accuses Traffic and associated companies of paying bribes to two CONMEBOL presidents and up to nine other presidents of national football associations, including the then presidents of the Brazilian and Argentine associations. There was a common history of Traffic to continue paying bribes for exclusive rights to the tournament during various iterations of the tournament, corrupt payments fraudulently wired and laundered via the U.S. and elsewhere. As documented in the image above, there were bribes as early as 1997 for the Copa América Cup contracts. Traffic was threatened in 2010, when a competing company, Full Play, sought to gain a foothold in the arena of these monopolized commercial rights. Traffic took Full Play and CONMEBOL to court in the U.S. for new contract infringement, but there was an out of court settlement and the creation of a new company Datisa, out of a combination of Traffic, Full Play and Torenos y Competencias. This was collusion at its finest. The era of Datisa was the current state the DOJ discovered the Copa América Scheme for the Centenario iteration of the tournament. It was from here that in 2013 South America’s governing body (CONMEBOL) reached an agreement with Datisa on a $240 million contract for rights to the Copa América in 2015, the Centenario in 2016, 2019 and 2023. At the official announcement of the tournament in Miami in May, 2015, there was Datisa logos shown at the press announcement. Sounds like a sweet deal for Datisa? How could you not want to try all the flavors of cookies on the table? Oh, but then there was 14 people charged with bribery with who would be the television provider, sponsorship rights and host location royalties. The elephants in the room where sponsorship and television rights. You get a car, you get at car. No, not like Oprah Winfrey on a holiday special of her T.V. program, but rather Datisa agreeing to pay 110 million in bribes for 4 soccer tournament, one of which was the special event in the U.S. Soccer officials allegedly guaranteed revenues of $352 million. According to the U.S. Justice Department reported that some $40 million in bribes had been paid by the time of the revelation of the debacle. Why is the U.S. Hosting? 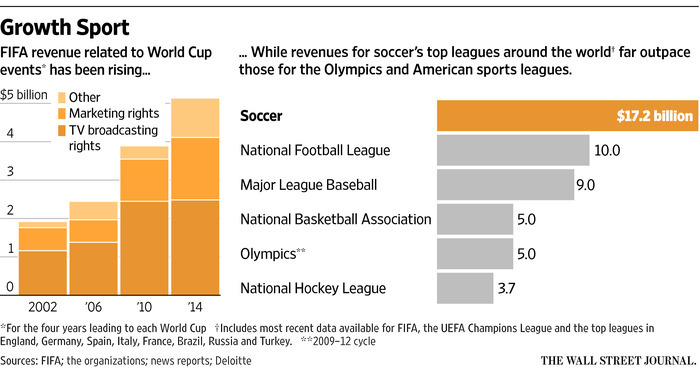 The perception that Americans don’t care about soccer is turned on its head when it involves scandal and money. By definition the United States is excluded from the Copa América with the exception of meriting the two open contender places. As stated in the USA Today Sports by Martin Rogers, “The reasons for staging this go around in the U.S. boil down to finances and revenues to be generated from both North American television rights and from stadiums backed with both expats and locals.” This will be the first time the U.S. has hosted a major soccer tournament since the 2003 FIFA world cup. In the WSJ depiction of the, “Growth Sport” below, it is clear that the revenues from global soccer leagues clearly trump all other sports and competitions, to the alarming sum of about $17.2 billion, besting the $10 billion, $9 billion and $5 billion of revenue respectively generated by the National Football League (NFL), Major League Baseball (MLB) and National Basketball Association (NBA). Also interesting is the breakdown of said funds as it applies to the FIFA World cup and thus can be extrapolated in part for the Copa América tournament as a model, whereby TV broadcasting and marketing rights account for over ¾ of the FIFA revenue. Land of the Free, Home of the Brave and Infrastructure for Mega events. The United States is an ideal venue for the Copa América as it as the Infrastructure and transportation hubs in dozens of U.S. cities to absorb thousands of spectators, the venues with capacity of more than 50,000, coverage and support of spectators. It is a perfect storm of scale and star power for the world’s largest media market. Key levers for the tournament will be attendance, ticket sales and U.S. market awareness. Ticket sales are projected to be between 1.5 to 2 million fan attendance for 32 individual matches. “The scale of the 2016 Copa América Centenario will be, at a minimum, twice the size of Copa América 2015, from both in-stadium attendance, global television reach and US market awareness,” Kathy Carter, President of Soccer United Marketing, Major League Soccer’s commercial arm, told Forbes. Additionally there will be top market value players playing center stage, such as Messi, Luis Suarex and James Rodrigues. The TV and digital engagements will allow for global in person engagement. The top ten most followed Copa América Players have a combined following of over half a billion across Twitter, Instagram and Facebook. What is the result of the television rights for this most significant soccer event in the U.S. since the 1994 FIFA World Cup (CONMEBOL)? Fox has secured the rights to broadcast this year’s Copa América Centenario: all 32 matches on Fox, FS1 or FS2. Fox bested ESPN for English TV rights, while ESPN holds the UEFA Euro 2016 broadcast rights in the U.S.  Univision who is acquiring Spanish Language rights to telecast Copa América 2016 Centenario in the US and Spanish speaking nations. Univision is the only channel who will provide coverage in Spanish in the United States and for that, they paid estimated US$60 million. They have lost Spanish-language US rights to Fifa-sanctioned tournaments to Telemundo in 2015. Futterman, Matthew, Aruna Viswanatha, and Christopher Matthews. “FIFA Corruption Allegations Reach Into Soccer’s Highest Levels.” Wsj. DOW Jones & Company, 27 May 2015. Web. 19 Apr. 2016. Futterman, Matthew. “The FIFA Bribery Scandal’s Miami Connection.” WSJ. DOW Jones & Company, 7 Dec. 2015. Web. 19 Apr. 2016. O’Brien, Rosalba. “Corruption Scandal in Latin America Takes Shine off Copa America.” Reuters. Thomson Reuters, 11 June 2015. Web. 14 Apr. 2016. Brieri, Walter, and Associated Press. “US Indicts 16 More in Probe of World Soccer Corruption.” HeraldTribune.com. Gatehouse Media, Inc., 3 Dec. 2015. Web. 19 Apr. 2016. Sciaretta, Brian. “Copa America Centenario Could Be a Game Changer.”Americansoccernow.com. American Soccer Now LLC, 30 Apr. 2014. Web. 19 Apr. 2016. Levy, Dan. “2016 Copa America Is Game Changer for US.” Bleacher Report. Bleacher Report Inc., 1 May 2014. Web. 19 Apr. 2016. Futterman, Matthew. “FIFA Scandal May Jeopardize Copa Centenario Tournament.” WSJ. DOW Jones & Company, 2 June 2015. Web. 19 Apr. 2016. Rogers, Martin. 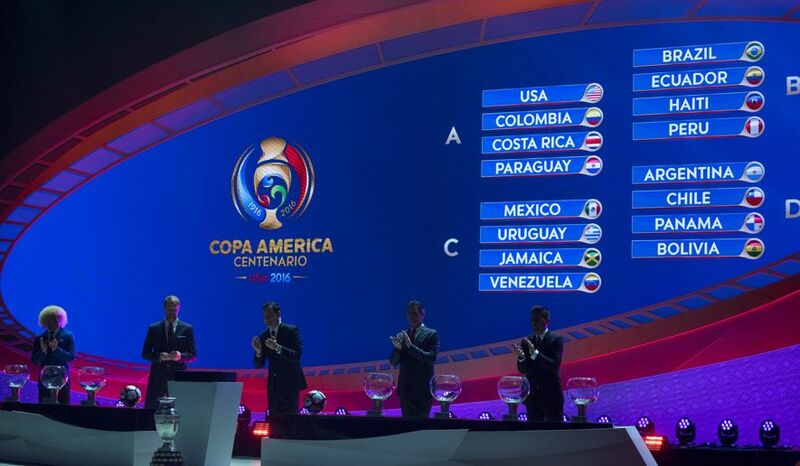 “Copa America Centenario Will Offer Americans a Thrill.”Usatoday.com. USA TODAY Sports, 2 Feb. 2016. Web. 19 Apr. 2016. Price, Greg. “US Soccer News: 2016 Copa America Centenario Expected To Go Through Despite FIFA Scandal.” International Business Times. IBT Media Inc, 02 Dec. 2015. Web. 14 Apr. 2016. “U.S. 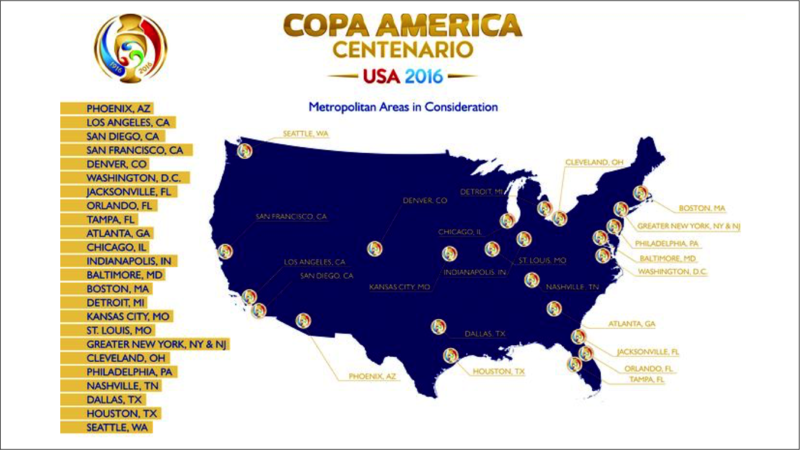 Soccer to Host Prestigious Copa America Centenario in the United States.” U.S. Soccer. U.S. Soccer, 23 Oct. 2015. Web. 14 Apr. 2016. AFP. “Copa Centenario to Be Biggest Ever.” DailyMail.com. Associated Newspapers, 15 Jan. 2016. Web. 19 Apr. 2016. Heitner, Darren. “Copa America Could Be Biggest Sporting Event in U.S. This Summer.” Forbes. Forbes Magazine, 15 Jan. 2016. Web. 19 Apr. 2016. Smith, Chris. “Copa America Centenario: Coca-Cola, Sprint And State Farm Join As Official Sponsors.” Forbes. Forbes Magazine, 29 Feb. 2016. Web. 19 Apr. 2016. Panja, Tariq. “Copa America to Emerge From FIFA Scandal Seeking New Partners.” Bloomberg.com. Bloomberg, 20 Oct. 2015. Web. 19 Apr. 2016. Kennedy, Mike. “IMG and Soccer United Marketing Get Copa America Rights.” Sportspromedia.com. SportsProMedia Limited, 2 Dec. 2015. Web. 25 Apr. 2016. “CONCACAF and CONMEBOL Award IMG and Soccer United Marketing Copa America Centenario 2016 Commercial Rights.” Conmebol.com. Conmebol, 2 Dec. 2015. Web. 14 Apr. 2016. Sargeant, Paul. 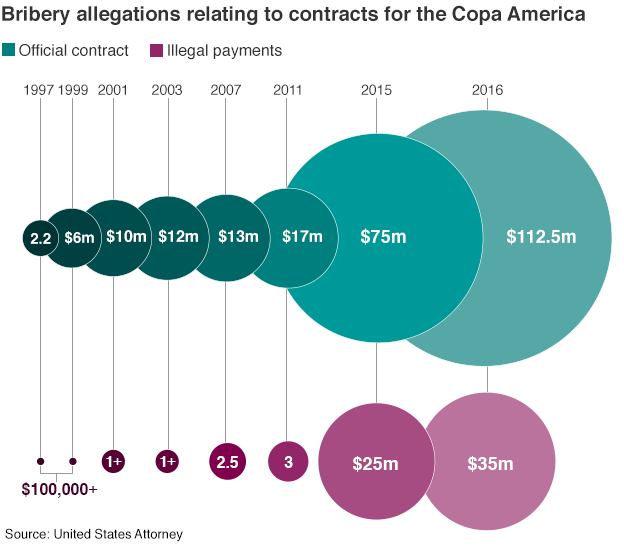 “Football Corruption: Who Bought the Copa America?” BBC News. BBC, 11 June 2015. Web. 25 Apr. 2016. Gowar, Rex. “Centenary Copa America Tournament in U.S. in 2016 in Doubt.” Reuters. Ed. Martyn Herman. Thomson Reuters, 02 June 2015. Web. 25 Apr. 2016. TOTALSPORTEK2. “Copa America 2016 TV Channels Broadcasting Worldwide.” TOTAL SPORTEK. Disqus, 18 Mar. 2016. Web. 26 Apr. 2016.